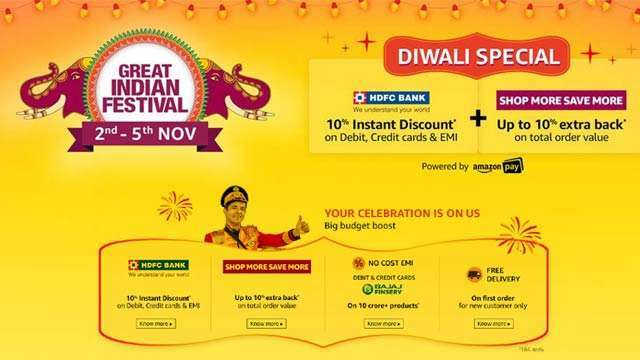 In response to the Flipkart Diwali sale, the Great Indian Festival Sale will be held at the e-commerce site, Amazon India. Amazon's Diwali cell will start from November 2 and continue till November 5. This time Amazon has partnered with HDFC Bank for the cell. With this help, customers will get 10 percent additional discounts. Apart from this, a 5% cashback on purchases between Rs 2,000 and Rs 4,999 will be given an additional 10% cashback on purchases of over Rs 5,000. The amount of cashback will come on Amazon Pay Balance. The most important offer in this cell will be linked to OnePlus 6T. Its sales will start from November 1 and it will come with several launch offers. There is also an option of non-interest EMI from Amazon. New customers will be given free delivery of orders first. Customers will be given books and Swigi vouchers and Amazon Pay balances on purchases above 500 rupees. There will be great discounts on smartphones like Redmi 6 Pro, Samsung Galaxy A8 + and Realme 1. Laptops will get a discount of up to Rs 25,000. Mi TV 49 inch Flash Cell will be held every afternoon at 11 a.m. With large appliances, an additional 22,000 rupees discount will be given on the exchange by Amazon. Brands like OnePlus, Honor, Xiaomi, Samsung, Realme, Huawei, Vivo and Motorola will be part of this cell. Up to 65 percent discount on Amazon Basics product will be available. Select mobile will come with free DMZ protection. Read about all offers by clicking here.